Clarins Extra-Comforting Toning Lotion Review: Does It Really Work? 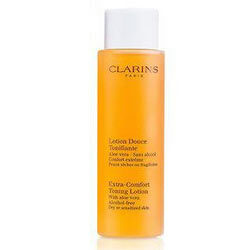 Clarins Extra-Comforting Toning Lotion, US $26.00 for 6.8 Fl. Oz., is a toner formulated as a lotion preparation to calm, soothe and comfort chronically dry skin and sensitive skin instantly, and, with regular use, over the longer term. This multifunctional product also improves your skin health by fortifying the outer skin barriers, making it harder for moisture to escape to the environment. Natural anti-inflammatory ingredients like aloe and the protective antioxidants also help alleviate damage caused by irritations, flaking, redness and swelling prevalent in sensitive and dry skin. This product is designed and distributed by Clarins, one of the world’s most recognizable brands in beauty and skincare. Sunflower : Sunflower is used in many ways. The oil and wax from the seeds have moisturizing and protective benefits. Clarins Extra-Comforting Toning Lotion is recommended for use with your evening skincare regimen only due to its retinyl palmitate content, and following a fresh skin cleanse. Apply product on skin using cotton pads, then follow through with your anti-aging creams. Clarins Extra-Comforting Toning Lotion contains uniquely beneficial ingredients that are guaranteed to promote moisture boost and better toned skin. Unfortunately, it is likely that these ingredients are available in the formula in very low, negligible quantities to make any noticeable improvements in your skin. There are other products out there that are similarly formulated, not laden with toxins, and available at a much more inexpensive price tag.